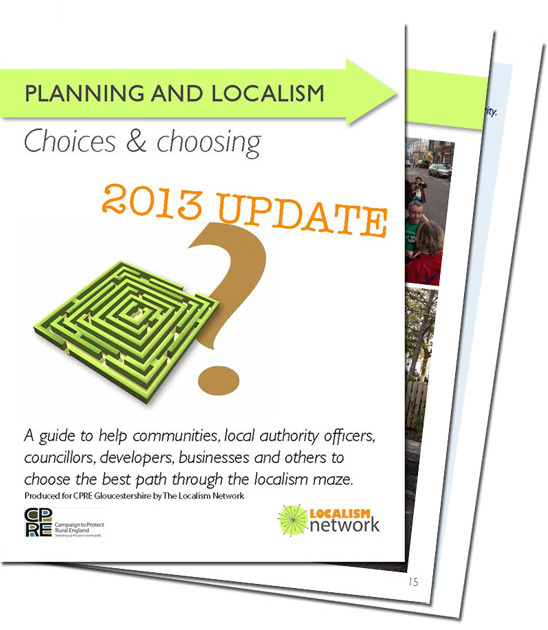 Prompted by positive feedback from a range of audiences, the extremely successful Guide to Planning and Localism has been updated in 2013 to reflect recent practice. genuinely collaborative working - is essential to everything this guide is about because it is only through working creatively together that truly sustainable solutions will emerge. We were appointed, together with Professor Stephen Owen, by CPRE Gloucestershire early in 2011 to contribute to the unfolding government policy on Localism. Part of the project aim was also to produce some practical outcomes to address the new context and the options available to communities, and planning and development professionals. The resultant guide has proven to be very successful and used by a range of audiences to aid in the decision making process.